Researchers have clarified the development of the ability to attend to a speaker in a noisy environment—a phenomenon known as the “cocktail party effect.” Published in JNeurosci, the study could have implications for helping children navigate the often-noisy surroundings in which they grow and learn. Marc Vander Ghinst and colleagues used magnetoencephalography to measure six- to nine-year-old children and adults’ brain activity while listening to a recorded storyteller mixed with background conversations. The researchers found that, compared to adults, children’s brains struggled to focus on the intended speaker’s voice with increasing background noise levels. 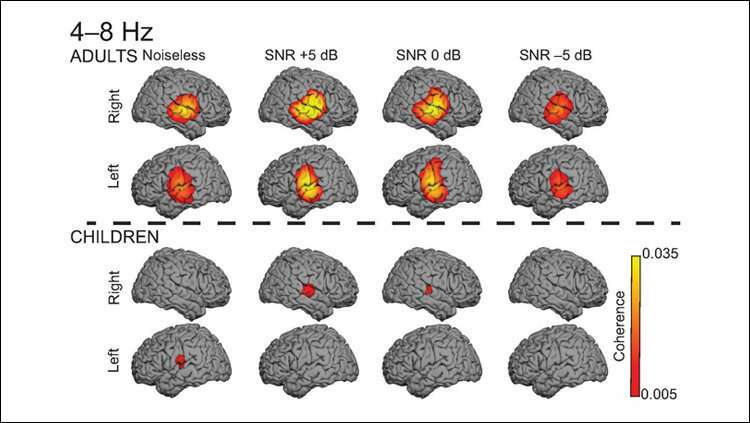 Children’s brains also had trouble following the syllable rate regardless of the amount of background noise.